Welcome back to the n00bs guide. So what is a smart Wearable gadget, well the answer is very simple a smart wearable device has an embedded OS which has attached sensors to it and does a specific operation, for example Fitness bands keeps tracks of your burning calories and the no. of steps you are walking. And at the end of the day you can couple it with a Smartphone or look at some Cloud client to see all the stats. As the Microchips are turning smaller day by day it is becoming feasible to produce and apply them in large scale resulting in such small wearable gadgets. They might look ordinary from a distance but do a great deal of jobs for you and makes your life easier. So let us start the round up with the Gadgets available in Indian Market. A smartwatch is a device which gets connected to your smartphone and give important feeds and notification on it, it has an Embedded OS like android or Tizen and can be connected via WIFI or a Bluetooth connection to any android or iOS device. It might benefit people who are traveling in crowded places and can’t take out their phones, apart from that many of these devices are water and dust resistant and somewhat shockproof. What are its capabilities and future ? A fitness band or activity tracker as its name suggests is a tracking device which tracks your daily health stats and helps you achieve your goals too. It records the movements and sleep pattern and tells you about it. All the fitness bands have at least one feature in common that is called a pedometer which counts the number of step you taken while walking or climbing stairs. It is like a little coach which is with you like all the time, encouraging, discouraging and telling what is happening in your body. Again the people who are on the move and can’t look after their health it is a great tool for them as it tracks all the stats from your eating pattern your sleeping patterns, the steps you move in a day and will give adequate tips to improve your health. It is like a health monitor attached to you all day. What are its capabilities and future? In today’s world everybody is busy, and nobody is concerned about their health, we as young generation rely on fast food and long working hour, so it becomes mandatory to regulate ourselves and manage that we are doing all day, it might help in improving the life expectancy. And increase the quality of living. A smartglass is a device which equips an Embeded OS and has sensors and a microprocessor which gives real-time updates to the user or the person who is wearing that smartglass. Well this segment is pretty new in the market and hasn’t been launched properly, but still is available somehow. It is capable of capturing images and videos on the go without even telling people that they are being recorded but the main concern comes with these is its privacy. Everybody needs it. Who doesn’t want to look cool, it more like a fashion accessory to people. Apart from that people are massively active on social media and want to share every second of their life in real time this is a great tool for them. Apart from that as it can give real time updates we don’t need to constantly dig into our phones for the obvious stuff and notifications. It has vast possibilities for both consumer and commercial sector ranging from military to medical sector and normal people. It might be the next game changer in the segment. Currently it supports video recording, GPS, making calls , internet search etc. and the innovation wont stop with it. As the name suggests it is the next generation gadget which is not cheap at all. It sits on your head and let you control other things be it software or hardware. It uses the brain’s electric signals (Electroencephalography EEG) amplifies them and respond accordingly. As it is in its infant stage, nothing can be said much about it right now, the production cost is quite expensive right now, and so its availability, it costs around $400 to the normal consumer, many users use it to control their games, drones or other hardware. It can be used for checking the concentration of the user too. The future lies in the hands of the user and producer, in the coming years it can be used by the medical professionals and military intelligence and so on; it might be a game changer in the gaming segment and bring a big revolution for the prospected gamers. 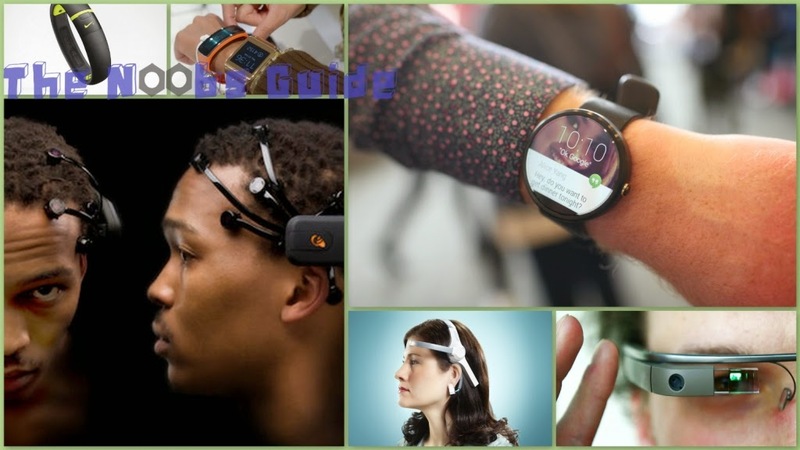 I hope you like this article and got some knowledge on wearable technology and gadgets. If you really like this post then please do like the Facebook page and share this post with your friends, you can also tweet @n00bsguideblog. If you have anything to say use the comment section. thank you and have a good day!